Having arrived very early into Krabi via a morning flight, it was now a long wait before 2pm. It was raining in Ao Nang due to the rainy season. As most of you know, after my Seattle trip in 2013, I am immune to rain. I embrace it. Our hotel was strategically located on next to 24 Hours McDonalds and a Starbucks Coffee. Time to burn 5 hours and so we sat and talked, a healthy conversation unlike those who choose to stare at smartphones. It was pouring the entire day. It was my first Soy Milk Caramel Macchiato ( my lactose intolerance ) and no I did not enjoy it. After a few hours lazing on the outdoor couch with the pitter patter of rain, we moved to McDonald’s where I got my teeth sunk into McDonald’s Thailand’s Pork version of burgers. You can change all types of beef burgers to pork. Big Mac Pork burger for me! 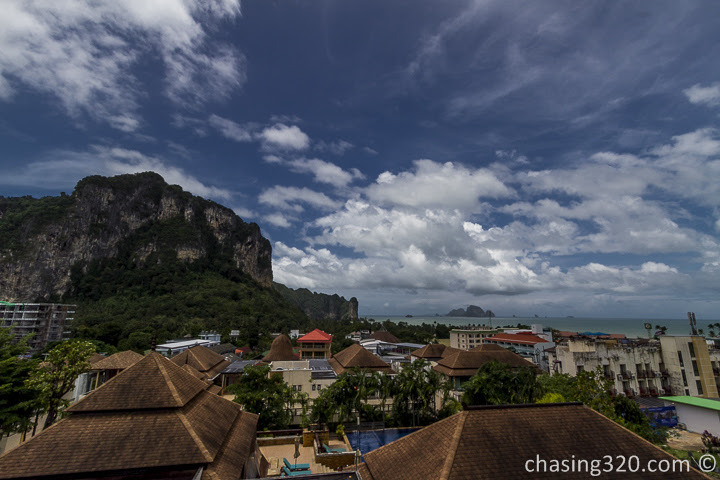 Check in to Ao Nang Cliff Beach Resort was simple. Collected the keys and headed up quite a distance. Nice comfy bed but I love the day bed. I liked the small bath tub located on the balcony. The angle is just nice for you to see the beach and sea of Ao Nang and the strategically placed plants allow for some privacy. This was really a hotel built on a cliff hence the slight walk up to the hotel rooms facing the sea. An overcast and rainy day. Time to chill. By the way, the breakfast here is purely functional.